Buying used furniture has a variety of benefits. Not only is it a fun and unique way to furnish your home, but it also is easy on your wallet. While used furniture comes with great benefit and reward, there is also some risk involved. When you want to buy used furniture, it is important to ensure that the piece you choose provide years of comfort, use, and that it will fit with the current style, decor, and other furnishings in your home. 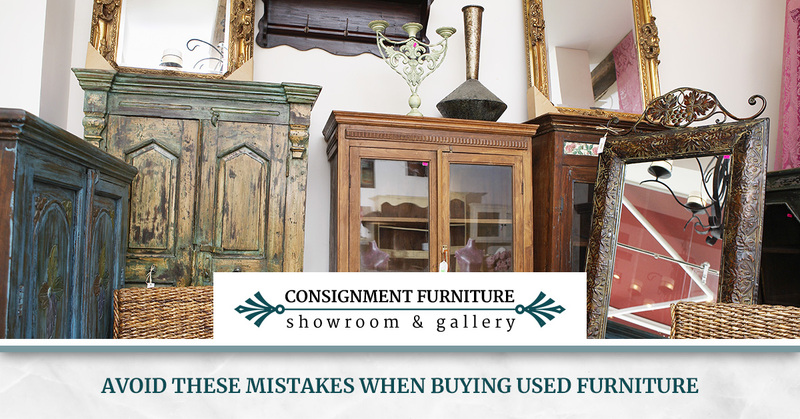 As a consignment and used furniture store in St. Petersburg and Clearwater, Consignment Furniture Showroom and Gallery has a few tips to remember when you shop for used furniture pieces for your home. Noticing an unappealing smell when you are looking at used furniture is something that should not be ignored. Smoke, pet odors, and stains can all leave behind an unpleasant smell on furniture and upholstered items. You may think a few sprays of air freshener will fix the issue, but this is highly unlikely. Strong scents, like discussed above become infused with the fabric of the furniture, making that much harder to get out. Ideally, you want to find used furniture that is free of unpleasant stains and smells. When shopping for used furniture, part of the challenge involves seeing the potential of an item rather than dwelling on its current look. Instead of looking solely at the pattern or color of the furniture, be mindful of its brand, price, and level of comfort. Remember, it’s easy to replace a cushion or do other simple fixes if that is all a piece of furniture needs. Many people prefer shopping for name brand items. While there is a level of security in buying brands you know and trust, you want to be a bit more open-minded when looking for used furniture. Just because you don’t recognize the brand of a piece of furniture does not necessarily mean it is not high quality. If you are not sure about the origin of the used furniture, don’t be afraid to ask! Buying the wrong sized furniture is more common than you may think. This is susceptible to happening when you do not measure the available space and the actually piece of furniture itself. You should never go by how big the piece looks in the used furniture store. A couch may look deceptively small in a showroom, but there is a chance it may be too big for your living room. Therefore, it is essential to take the necessary measurements before you begin shopping to avoid this error. The furniture you buy should coordinate with your existing furniture style. The style should be one that you are comfortable with, not just aesthetically, but also how that particular style functions for you. Be sure to carefully consider the design of a piece to prevent buying something that is completely out of place in your home. Consignment Furniture Showroom and Gallery has been providing new and gently-used furniture in St. Petersburg and Clearwater for the last three decades. We carry a wide selection of quality furniture pieces in good condition that will fit perfectly in your home, including kitchen furniture, bedroom furniture, furniture for your kitchen, and so much more! We only sell furniture that is in good condition and from smoke-free environments, so we eliminate many of the problems associated with used furniture, helping you avoid the above mistakes. For affordable furniture, stop by Consignment Furniture Showroom and Gallery today!